These play yards were sold with a bassinet, changing table, mobile as well as a storage area in some models. The model number can be found on the sew- in warning label located at the bottom of the play yard. 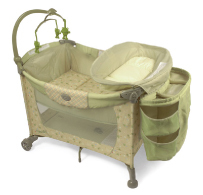 Testing by Health Canada has revealed that a child’s weight presses the center of the bassinet downwards, increasing the angled surfaces at either end of the product. Health Canada believes if a child is left unattended in the bassinet portion of the playard, small movements of the child could cause the child to slide, posing a potential risk of injury or death due to suffocation. If recommendations in Health Canada’s Consumer Information - Safe Sleep Practices for Infants are not followed, then this condition can become more hazardous. Health Canada has received one reported death which occurred when the child was placed in the bassinet attachment of the playard with blankets and a soft stuffed toy. The playard includes instructions which state that the child is not to be placed in the bassinet with blankets. 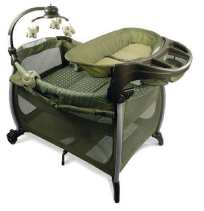 Dorel Distribution Canada has received 4 complaints of the bassinet in these play yards not laying flat, with no reported injuries relating to this condition. Consumers should immediately stop using the bassinet portion of the play yard and contact the company by visiting the website at or contact Dorel Distribution Canada at (888) 234-2455 between 8 a.m. and 4:30 p.m Monday through Friday to receive a free kit to address the issue. Consumers should not return product to retail stores.